Some days ago we have started a Mobile Learning Discussion Group at the Business Network called xing.com. This group was opened on the 6th October 2008 and as one of the group moderatos I glad that today we already have 142 members. This platform is for information and exchange of industry experts and interested persons who deal with a topic of Mobile Learning. In several forums the participants debate about ideas, challenges, experiences, products and services. 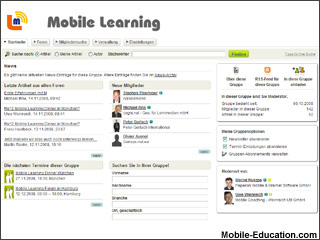 Our Xing Mobile Learning Discussion Group is also a place to find cooperation partners for projects and to be up to date on topic relevant dates and events. So if you are at xing.com stop by our Xing Mobile Learning Group – we would be pleased to see you.